When you say your prayers tonight, give thanks that you are not a biology teacher in a red state. My profession is under constant pressure over the teaching of evolution. The assault is most tenacious in public K-12 schools. Frustrated by the courts in their efforts to ban the teaching of evolution in schools, some state legislatures have tried to circumvent court rulings by threatening dismissal of teachers who present evolution as a "fact" rather than as a "theory." This does not reflect a growing legislative interest in general semantics, but a fundamentalist theocratic attempt to diminish the effects of science education. The Gallup polls over the past 30 years suggest that American biology teachers aren't doing a very convincing job teaching evolution to their students. For example, in 1982 the Gallup poll found that 44% of Americans were creationists. In 2012 that percent had risen to 46. Some biology teachers simply ignore the teaching of evolution out of fear parents will take offense and, more important, take control of the school board. College biology departments are a bit more insulated from the political pressure, but even we have felt the stings of the arrows of the fundamentalist religion when we teach units on evolution. I have had students who've refused to attend class during the unit on evolution. In a genetics class an interpreter signing for a deaf student refused to sign the evolution unit. A biology department in a local community college responded to the tension by simply deleting the unit on evolution from their general biology classes. Fortunately, my college has not yet bent to the popular will. But I do approach the teaching of evolution with some trepidation. I make it clear to the students at the outset that I am not here to tell them what to believe; I am here to help them understand. I will test them on their understanding, not on their beliefs. I teach evolution somewhat different from my colleagues to address the persistent creationism among students. Instead of merely explaining evolutionary theory, I contrast it with the equivalent theories from Genesis. After all, most of those who object to evolution in the classroom do so because of their Biblical beliefs. They tend to view evolution theory as fantastic or absurd, but not the theories of origins in Genesis. The only reasonable way to understand the advancement embodied in the theory of evolution is to contrast it with the theories that it displaced and that are still widely accepted throughout the public. In this way we can see which viewpoint has more structural similarity with the facts. 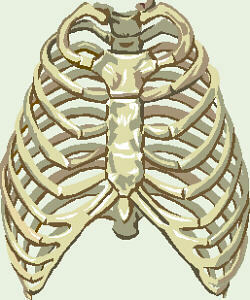 I usually show a human skeleton to my students and have them count the ribs. Then I ask whether it is the skeleton of a male or a female. The result is almost always a heated debate. Some say male, some say female. Usually no one points out that you cannot differentiate human male from female on the basis of the number of ribs. Such is the deficiency of their education. Then I point out to my students that not only do the two Genesis accounts contradict each other in terms of their sequence of events, but that they also contradict the order of succession for major groups as revealed in the fossil record. I discuss how evolutionary theory is capable of being falsified. For example, the discovery of human remains in a layer of ancient rock that contains only unicellular organisms would thoroughly demolish the theory. This could happen, but it hasn't happened yet. Then I ask my students what evidence could falsify the Genesis accounts. I contrast the attitude of biologists toward Darwin with the attitude of fundamentalists toward their Bible. Although Darwin is probably the most revered of biologists, still his views have been repeatedly put to the experimental test and have been discarded by biologists when they failed the tests. For example, Darwin believed (after Lamarck) in the inheritance of acquired characteristics. Weismann cut off the tails of newborn mice for more than 20 generations but found no effects on the inheritance of tail length. The experiments of Weismann and others led to the rejection of Darwin's notion of gemmules and pangenesis.